Is there more to life than this? Why does God allow suffering? What happens when I die? Is Jesus the Son of God? We all have big questions we want to ask. The Alpha course is an ideal opportunity to discuss our hopes and fears, our faith and our future. You don't need to be a Christian to come to Alpha, just interested in asking questions or learning about the Christian faith. Many guests have never been to church before. Alpha is a series of interactive sessions that freely explore the basics of the Christian faith. The course runs for 10 sessions on a Wednesday evening and includes a talk about the Christian faith, followed by discussion time where you can share your thoughts and ask as many questions as you want. What are the talks about? We ask questions like ‘Is there more to life than this? Who is Jesus and why did He die? How can we have faith? Why and how do I pray? Why and how should I read the bible? Does God heal today? How does God guide us? There is also an Away Day on a Saturday midway through the course which is held in a local venue. The Away Day sessions ask: Who is the Holy Spirit? What does the Holy Spirit Do? How can I be filled with the Holy Spirit? I'd like to come, who do I contact? Contact Andy Rimmer on 0208 441 6173 or just turn up! There is no charge for attending the Alpha course and coffee and puds are thrown in! What if I try it and don't want to come back? Alpha aims to be a low pressure and non-threatening experience. If you don't feel that the course is for you, you are under no obligation to return. Are my questions too controversial for church? All questions are welcome. 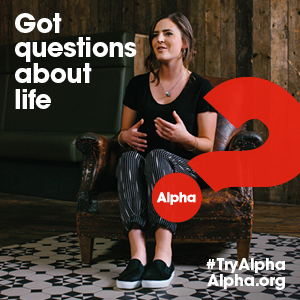 Alpha is designed for people to freely ask the tough questions about life and the Christian faith.